Ignacio Ortiz Cedeño was born in La Piedad, Michoacan, Mexico. At his 12 years of age his family moved to Monterrey, Mexico where he started to study the art of painting with the Spanish painter Carmen Cortes. At 18, he started at the Taller de Artes Plasticas of the Universidad de Nuevo Leon where some of his most famous teachers were José Guadalupe Ramírez, Jorge Rangel and another Spaniard, Juan Eugenio Mingorance. 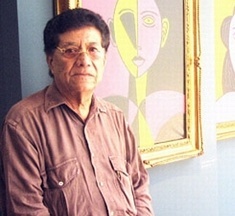 Helped by a scholarship awarded to him by Raul Rangel Frias, the Dean of the University, Ortiz settled in Mexico City to study at La Esmeralda where his teachers were perhaps some of the most notable figures in Mexican art of that time: Diego Rivera, José Clemente Orozco, Rufino Tamayo, Jesús Guerrero Galván, Pablo O’Higgins, Santos Balmori, Germán Cueto, Carlos Orozco Romero and Manuel Rodríguez Lozano. His great talent was recognized once again by the Instituto Nacional de Bellas Artes and he was awarded a scholarship to study at the Fine Arts School in Prague from 1958 and until 1960. Finally in 1968 he received another scholarship for a doctorate in Art History in Uppsala, Sweden. One of his times in Europe, Ortiz was fortunate enough to have met a clear influence in his life: Pablo Picasso. He was invited by this iconic figure to visit his atelier in Vallauris, France. Ignacio Otriz has exhibited from as early as 1947. His work has been shown in Mexico, Sweden, France, Czechoslovakia, Bulgaria, Spain and the United States.